We are midway through March, and the birds are on the move. We’ve been fortunate to enjoy some beautiful spring weather and all the accompanying flowers in the last couple of weeks. The next month or so will feature a lot of transition as our winter resident birds prepare to depart and some of our beloved summer residents return to spend the next few months with us. For instance, the Buffleheads that congregate on Wilbur Lake in Carter County are already dispersing to local rivers and ponds. After spending some time on these other waterways, they will be flying farther north. Buffleheads are cavity-nesting birds, so they will look for wooded lakes and seek out a tree with a large cavity or cranny. There, the female will lay her eggs and renew the cycle of life before the adults and a new generation return to winter in the region in several months. These little two-toned ducks with a dark and light plumage pattern have long been a favorite of mine. 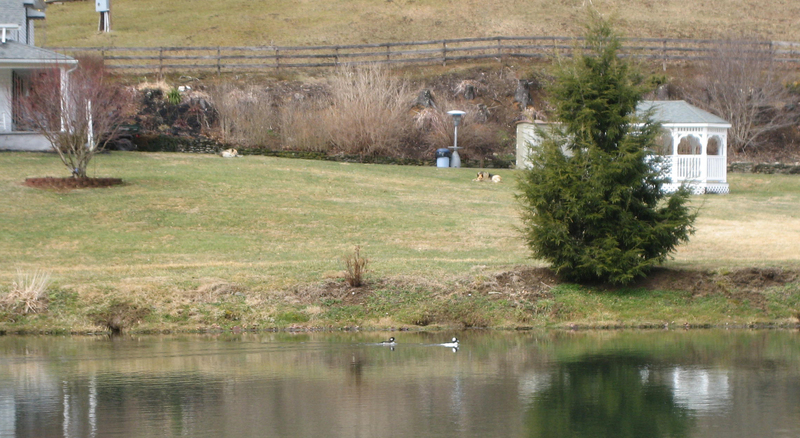 Patsy Schang sent me a photo of a pair of Buffleheads that visited a pond at her neighbor’s Roan Mountain home. As you can see from the accompanying photograph, the two Buffleheads look quite at home. These Buffleheads visited a Roan Mountain pond earlier this month. Patsy had no trouble identifying the ducks, and I congratulated her on her first sighting of Buffleheads, It’s always fun to see a new bird, especially so close to home. According to the Ducks Unlimited website, Buffleheads breed from southern Alaska through the forested areas of western Canada, central Ontario and eastern Quebec. The website notes that 90 percent of the population is believed to breed from Manitoba westward. So, these little ducks travel a long way to spend the winter on Wilbur Lake, Ripshin Lake and other locations in Northeast Tennessee. 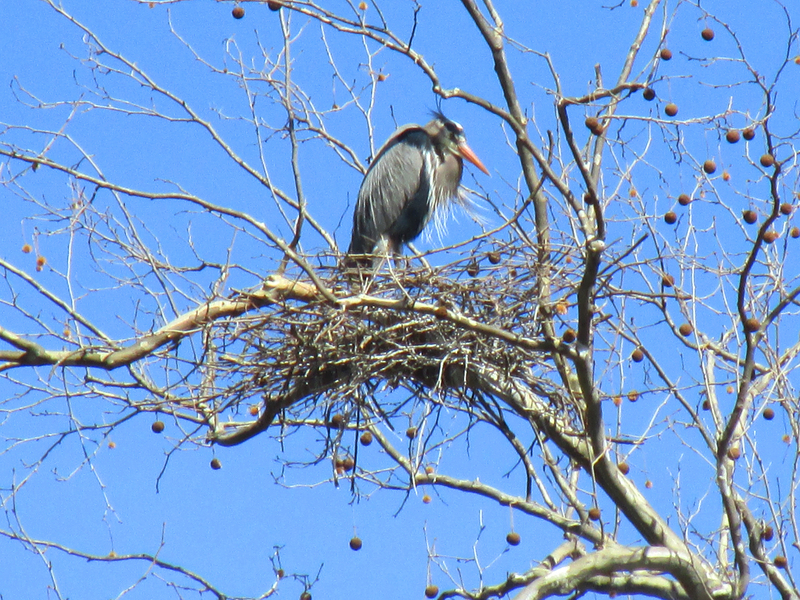 Karla Smith sent me an email about a nesting colony of Great Blue Herons in Elizabethton. 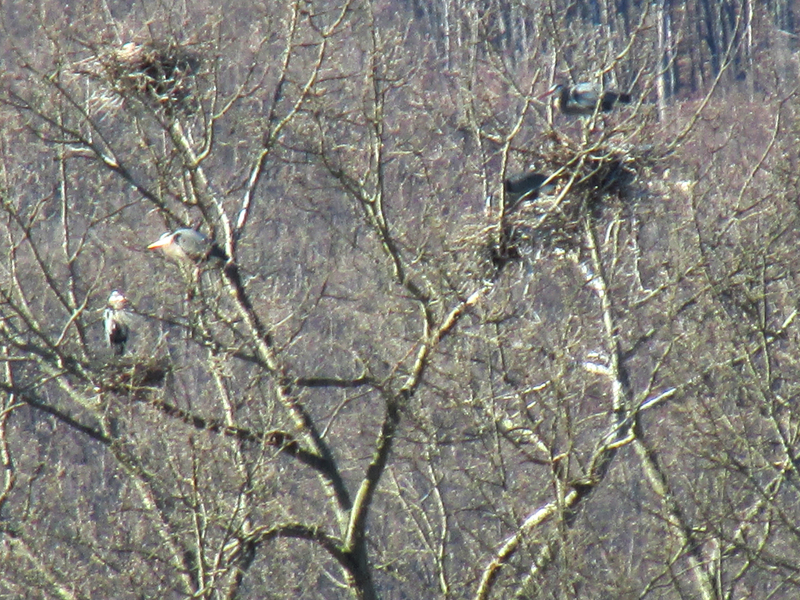 This colony of nesting Great Blue Herons is located behind the Elizabethton Municipal Airport. I went the next day and found the nests and several herons exactly where Karla informed me they would be. This is only the second time I have observed nesting Great Blue Herons in Carter County. I counted six nests and seven herons during my brief visit to the location. The two trees are on a steep hillside at the back of a field behind the Elizabethton Municipal Airport. From this location, the adult herons can spread out along the nearby Watauga River to find plenty of food once the young are born. In addition to the herons near the airport, there are at least two active Great Blue Heron nests along Blevins Road on the other side of Elizabethton. This location also served as a nesting place last year for Yellow-crowned Night-Herons. I posted about the heron nesting colony at the airport on my Facebook page and several friends shared interesting stories. A Great Blue Heron stands in a nest built in a tree over the Watauga River along Blevins Road in Elizabethton. Sandra “Snad” Garrett said she plans to check out the colony, which is not far from the Stoney Creek home she shares with her husband. Seeing the post reminded Elizabethton resident Rita F. Schuettler of a previous close encounter with a Great Blue Heron. In a follow-up moment, I congratulated Rita, telling her that it’s difficult to sneak up on a Great Blue Heron and that it sounded like they both got surprised. I saw my first Barn Swallow of the spring on March 19 at Anderson Marsh on the old Johnson City Highway near the Okolona exit. There was also a Great Blue Heron in the creek at the same location. The previous day, it was all about the raptors, as I found a Sharp-shinned Hawk on Simerly Creek Road, an American Kestrel in Unicoi and a Red-tailed Hawk and a Cooper’s Hawk both soaring in the same vicinity in Johnson City. Once I tossed in both Black Vultures and Turkey Vultures, it capped off what amounted to a pretty good raptor day. On March 17, the only wild waterfowl lingering at the pond at Erwin Fishery Park turned out to be a pair of American Wigeon. On land, I also enjoyed watching a large mixed flock that consisted of Common Grackles, Red-winged Blackbirds and European Starlings. They were feeding on shelled corn that some good-hearted person had probably left for the domestic ducks and geese that make their home at the pond. All this activity is proof that the seasons are changing, and with them the makeup of the birds that share our yards and gardens. 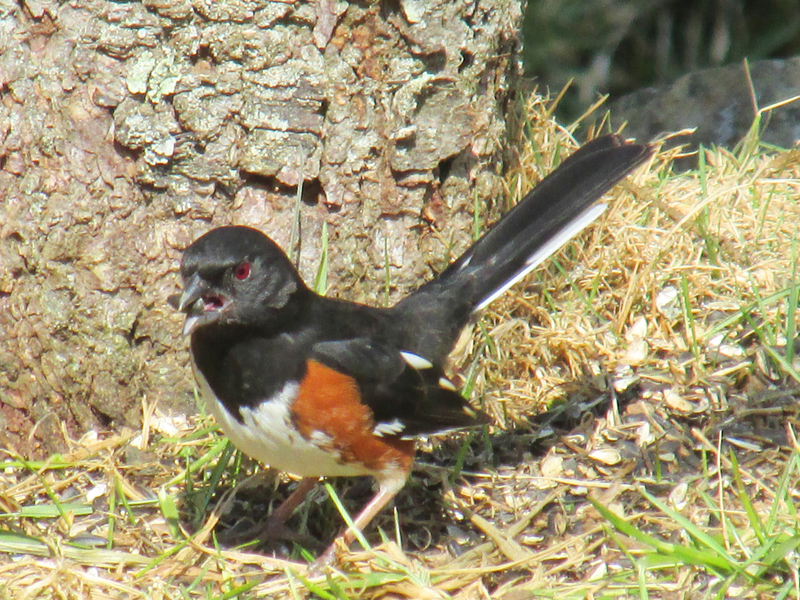 A male Eastern Towhee feeds on the ground beneath a feeder hanging in a tree. Elizabethton resident Dee Obrien contacted me on Facebook with a question about a bird she saw recently at her home. I was glad Dee included the information on the bird’s behavior. Details like that are just as important as size and coloration. From her detailed description, including the information about its ground-feeding habits, I was able to figure out that she had seen an Eastern Towhee. Later, she notified me that she had consulted a field guide and agreed with my identification. It’s great to hear from so many fellow bird enthusiasts. That’s been one of my goals with this blog. I hope to continue to receive communications from readers. Otherwise, it’s just me writing about the birds I have seen. I’d much rather have this blog become more engaging and interactive where people can share their enthusiasm for our fine feathered friends. It’s easy to post comments on my new blog at ourfinefeatheredfriends.wordpress.com. You can also reach me on Facebook or send email to ahoodedwarbler@aol.com. Please share the link to the blog with others who might be interested in the topic of birds and birding in Northeast Tennessee. There’s a new poll this week. Here’s the answer to last week’s poll. Which of the red-necked birds in the list specified in the poll isn’t a real bird? Well, the answer is Red-necked Goose. I hope everyone got the correct answer. This entry was posted in Birding, Birds and tagged Bufflehead, Buffleheads, Eastern Towhee, Elizabethton Star, Erwin Record, Great Blue Heron, Heron nesting colonies, Herons, Red-winged Blackbird, Spring birds, Towhees on March 23, 2014 by Bryan Stevens. Good blog with lots of information, keep up the good work. Enjoying reading about birding NE TN. Keep up the good work!